I hear these terms Dvaita, Advaita, Vishistadvaita, Shuddhadvaita, and may be any other XYZdvaita, etc in most of the questions but I am not very sure what do they refer to. Are these some communities driven by a particular group of people just like we have Valmiki-samaj, etc or they are just thinkings/philosophies. What is the difference between them and whether people following them do/perform anything in different manners. Do we also have some texts from Vedas or Puranas which divide them. If there is then please provide examples. Q. I hear these terms Dvaita, Advaita, Vishistdvaita, Shuddhadvaita, and may be any other XYZdvaita, etc in most of the questions but I am not very sure what do they refer to. There are six Darshan (षडदर्शन) i.e philosophy in Hinduism which are Samkhya, Yoga, Nyaya, Vaisheshika, Mimamsa and Vedanta. Q. Are these some communities driven by a particular group of people just like we have Valmiki-samaj, etc or they are just thinkings/philosophies. And followers of respected school or Aacharyas propagate their philosophies. 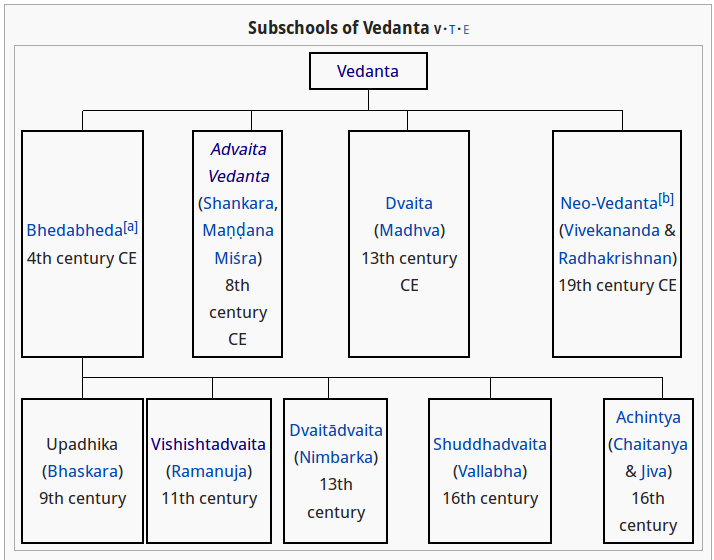 Actually the answer to the question Difference between them is Too Broad; Though visit Schools of Vedanta to get the overview of these different philosophies and respected article (on each school) to know the principle, thoughts and practices followed by respected schools. According to Advaita, there is only one absolute and ultimate truth - Brahman. ब्रह्म सत्यं जगत् मिथ्या which means only Brahman is real and universe is unreal. Universe is appeared/realize due to ignorance (अज्ञान/अविद्या) only [Snake & Rope Analogy], it is unreal and just like dream. After attaining the jnana and satya universe/world doesn't exist. जीवो ब्रह्मैव नापरः which means ultimately there is no difference between Jiva (Ataman) and Brahman. The individuality of soul is also due to ignorance and after attaining jnana the non-duality (अद्वैत) of Ataman and Brahman is realized. According to Vishishtadvaita, Brahman (Paramatma/Sriman Narayana) is the supreme and inner soul of universe as well as jivatma. Universe and Jivatma have body-soul (Sharira-Shariri) relationship with Brahman. Jivatma and Universe is the body and essential part of Brahman. Universe is not unreal, it is the transformation of Brahman and Brahman (in its pure form) dwells inside it. Jivatma (individual soul) and Brahman (supreme soul) are different and Brahman dwells inside Jivatma. It is known as qualified (विशिष्ट) non-dualism (अद्वैत) as it asserts the non-duality of Jivatma and Brahman in qualified way. (i.e Jivatma and Paramatma doesn't exist differently - Paramatama always dwells inside Jivatma - both can't exist separately. But Jivatma and Parmatma are (not same) different. Vishishtadvaita emphasise/insist on Complete surrender (Sharanagati /शरणांगति) to Vishnu. According to Suddhadvaita, Brahman without maya is the cause for Universe. Maya is not unreal but it is shakti (energy) of Brahman. Apparent manifestation or dvaita prapanch (द्वैत प्रपंच) is not due to maya or unreal but it is the wish of Brahman/Krishna instead. Jagat (universe/world) and Samsara (metempsychosis) are different. Jagat is manifestation (without relation with maya) of Brahman and is real. Samsara is due to ignorance/nescience of real nature and is unreal. samsar has Uttpatti origination and Lay destruction; whereas jagat has only Avirbhav manifestation and Tirobhav disappearance. Jiva is not different from Brahman as it is a portion/part of Brahman (not reflation). The relation between Brahman and Jiva is like fire and spark. Jiva and world emanate from Brahman and conceal/absorb in Brahman. Jiva is not Brahman as it is in later condition (separation from Brahman). According to Dvaita, Universe and Jiva are separate from Brahman/Vishnu. All these three elements (Jiva, Universe and Brahman) are real and different (द्वैत) from each other. Brhaman/Saguna-Ishwar is creator-foster-destroyer (governor and controller) of Universe. Jiva/Atman and Brahman/Vishnu is completely different and eternal. Madhvacharya classified Atman into three categories (Nitya, Mukta and Baddha) which is different from all other beliefs/philosophies. Devotion to Vishnu leads to Moksha. Dvaita also emphasis/insist on Bhakti (devotion and surrender) to Vishnu. According to Dvaitadvaita, Brahman is the highest reality and nothing is superior to Brahman.Brahman is material and efficient cause (creator-maintainer-destroyer) of universe. Jiva and Brahman can be considered different and non-different. There is Dharmin-Dharma (धर्मी-धर्म) nature-relation between Jiva and jnana(ज्ञान). Just like sun is both light and source of light, Jiva is knower, can be knowledge and the processor of knowledge at the same time. Jiva is Knower(ज्ञाता), the doer(कर्ता) and the experiencer(भोक्ता). Ishwar is Controller(नियंता), filler(भर्ता) and witness(साक्षी). Jagat is of three different kinds viz. prakrta(प्राकृत), aprakrta(अप्राकृत), and kala(काल). Prakrat forms Prakriti/Jagat, Aprakrut forms the body of Brahman. Jiva and world are part of Brahman. Brahman transforms (as of just his nature) into chit (sentient) and achit (insentient) world and also remains in his true nature or nirvikar. Thus universe and Jiva are karya(work/effect) of Brahman. they are different(द्वैत) and also identical(अद्वैत) to their karan(cause) Brahman. Dvaitadvaita emphasis/insist on Bhakti as well as Jnana. Achintya Bhedabheda refers to inconceivable(अचिन्त्य) oneness(अभेद) and difference(भेद). (The nature of relationship between Jiva and Brahman is inconceivable to human mind). According to Achintya Bhedabheda, Brahman is simultaneously one with and different from his creation. The relationship between Brahman and Jivatman is like Sun and Sunshine. Qualitatively the Sun and the Sunshine are not different, but as quantities they are very different. Similarly Jivatman and Brahman/Krishna is are of similar quality but there is a vast difference in quantity. Chaitanya Mahaprabhu emphasis/insist on Bhakti (like of Radha) to Krishna and attaining the devotion of Krishna leads to Moksha. Q. Do we also have some texts from Vedas or Puranas which divide them. If there is then please provide examples. The Acharyas mentioned above wrote Bhashya on these Prashtanatrayi to explain, establish and promote respected philosophy. Here Brahma Sutra is considered very important as it summarise and systematize the philosophical and spiritual ideas in the Upanishads. These sutras were meant to synthesize the diverse teachings of the Upanishads. However, the cryptic nature of aphorisms of the Brahma Sutras have resulted in the formation of numerous Vedanta schools, each interpreting the texts in its own way and producing its own commentary. This is not so simple that one can understand the meaning and consistency as all texts are in the form of subtle and obscure Sutra. Guru used to explain idea of Upanishads with the help of these Sutras. Its complete knowledge was lost eventually and the necessity of writing Bhashya arose. The oldest Bhashya which is prevailing/popular and available is of Shankaracharya. After Shankara other Aacharyas have also written Bhashya on Brahma Sutra in accordance/favour and to support and prove their doctrine. The Bhashya of Ramanujacharya, Madvacharya, Nimbarkacharya and Vallabhacharya are popular. Notwithstanding the similarities to a certain degree among doctrines of Aacharyas, they are much different. It is very difficult to judge the own views of Badarayana and (to judge) which Aacharya's Bhashya supports and suitable to that becuase Sutras are very obscure and subtle. In addition to this problem, there is also one related problem that is: What are the philosophical views of those sayings/sentances of Upanishads which are coordinated in Brahma Sutra, What Badarayana has understood/explained and what Bhashyakara has understood for that. Firstly, Lord Vedavyasa wrote Brahmasutra, brahma(supreme) sutra(tool/formula) for understanding of vedas, which needs to be used when deep diving into vedas. 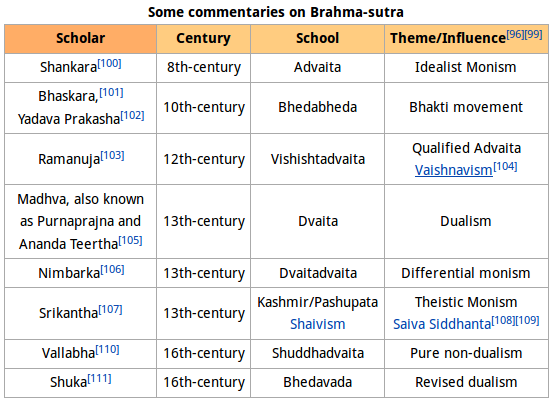 For this "Brahmasutra" there are 22 commentaries. 20 commentary was from Shankaracharya(interpreted as Mayavaada(every thing is illusion) now known as advaita( also it says there is no difference between soul and brahma the supreme power)). 21st commentary was from Ramanujaacharya whose interpretation of vedas was like(non differential difference) and the 22nd commentary (final) was from Acharya Madhwa(who interpreted this as differential difference that means, everything in the universe is different in many manners) , also he is the one who declared that the world/universe(Jagath) is satya(true, not maya illusion). So you can do a research on all three and choose which ever is convenient to you. Not the answer you're looking for? Browse other questions tagged philosophy vedanta advaita vishishtadvaita dvaita . Dwaita and adwaita: What do they mean?